Mark Lawrenson and Gary Williams have always been certain Brighton will win promotion to the First Division this season. They are both stars in a team which has been in top form in the League since November and neither player regrets moving from Preston nearly two years ago. “Things are great at Brighton with the club at the top of the Second Division.” says Lawrenson. “We have no qualms about leaving Preston North End because with Brighton we have joined a club that is just as good and which also has more money. 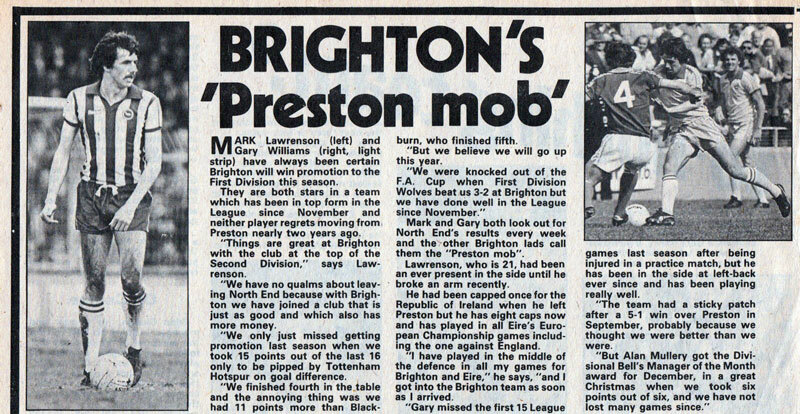 In 1978/79, just like Lawrenson and Williams at Brighton, bustling centre-forward Michael Robinson had hoped to get into the First Division himself with Preston. However, the Lilywhites suffered a terrible start. Nevertheless, he was sure he had nothing to fear. As he said to Football Handbook (Part 31): “I can’t see how we are going to go down. We have only the poor sides to play.” Speaking of the 5-1 score at the Goldstone, he added, “There’s nothing to fear because only Brighton have hammered us.” Preston eventually finished seventh, helped by winning the return match at Deepdale 1-0 in February. The Preston holy trinity was complete when Williams and Lawrenson were eventually joined at the Albion in the summer of 1980 by Robinson who arrived at the Goldstone via an unhappy spell at Manchester City.